We’re doing a lot of construction here in MLB.com’s offices, creating new mlb.tv production studios, and technical production facilities for all kinds of new mlb.com projects. This construction has left some big holes in parts of our building that are letting all the hot air in, and melting us geeks. The other side of the office is suspiciously cool… fortunately there’s an ice cream place downstairs, so we’re not in much danger of passing out, or losing any weight. This construction involves new machine rooms, new workstations, new servers, and new studio lighting, all of which creates even more heat, so the construction crews are installing several more tons of air conditioning equipment on our building’s roof. This gives me the opportunity to escape the melty-hot office and go up to the searingly-hot tar roof of the building. I could sing doo-wop songs about being on the roof in the city at night, but during the day, it’s just a frying pan up there. 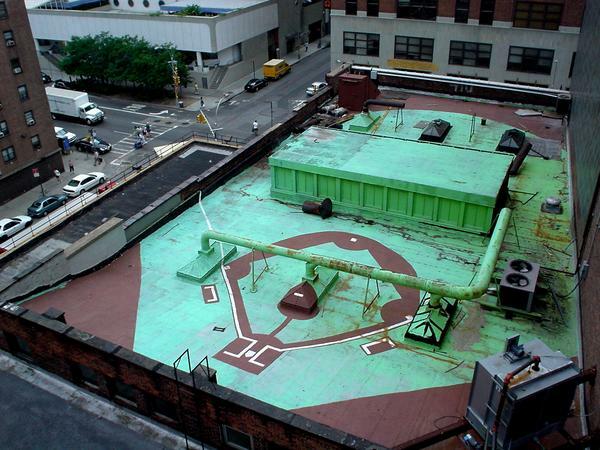 I believe there’s a long list of quirky ground rules detailing how you play around the giant pipes and how many bases the runner gets if the ball falls 6 floors and takes out a taxi. Looks like a killer place to play some wiffle ball!